The United Arab Emirates (UAE) has committed to invest US $10 billion in key sectors of South Africa’s economy, including tourism and mining, to support the sustainable development of the country. The announcement follows the State visit by President Cyril Ramaphosa, who met with his counterpart, Sheikh Khalifa bin Zayed Al Nahyan, in Abu Dhabi. In a statement, the Presidency said President Ramaphosa’s first visit to the UAE marked the beginning of a new chapter in the long-standing relations between South Africa and the UAE. “The leadership of the two countries reaffirmed their deep commitment to further consolidate their strong bilateral relations across a variety of fields, including trade, transport, infrastructure development, tourism, mining, investment and cultural cooperation,” the Presidency said. To support these efforts, a business forum was held between the UAE and South Africa, in which the UAE announced its plans to invest the $10 billion in key sectors. 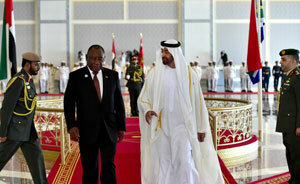 On arrival in Abu Dhabi, President Ramaphosa was accorded a ceremonial reception and was received by Sheikh Mohammed bin Zayed Al Nahyan, Crown Prince of Abu Dhabi and Deputy Supreme Commander of the UAE Armed Forces. President Ramaphosa also met with Sheikh Abdullah bin Zayed Al Nahyan, the Minister of Foreign Affairs and International Cooperation. The Presidency said the UAE further welcomed South Africa’s positive role in supporting peace and stability on the African continent. The two sides pledged to work closely together in order to promote peace, stability, prosperity, and tolerance in Africa and the Middle East.